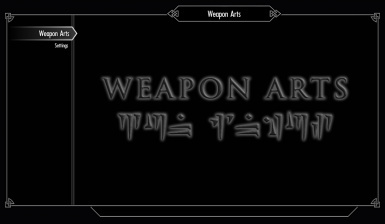 This mod adds to Skyrim weapon-arts (or weapon-skills), which are based on equipped weapon type and its enchantment. Mod was inspired by similar system in DarkSouls game series, and weapon-skills from VIGILANT. Vicn for inspiration from his amazing mod "VIGILANT"
Fixed mana consumption for staves. 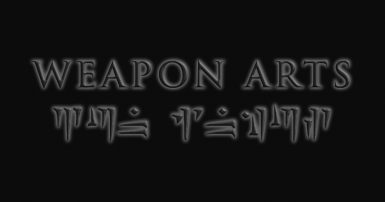 It adds to Skyrim weapon-arts (or weapon-skills), which are based on equipped weapon type and its enchantment. 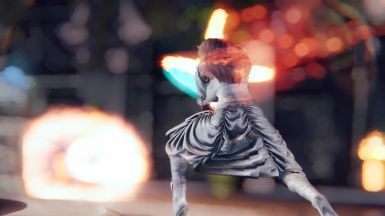 If player character has enough magicka, then using a lesser power added by the mod (Z button), the combat skill with special effects and animations will be performed. Depending on the type of weapon equipped, as well as enchantments on it, animations and effects will vary. At this moment all melee weapon types is supported, as well as dualwield, shields, bows and staves. Crossbows is not supported. Greatswords: "Explosive Cross". After a strong lunge, an impulse of energy in the form of a cross breaks down from the blade of the weapon. Explodes when it hits the target. Warhammers: "Power Strike". A strong blow with a hammer on the ground. Large area of effect. Battle Axes: "Horizontal Cleave". A large wave of energy spreading horizontally. It passes through enemies. Wide angle of impact. Swords: "Double Strike". Two strikes in a row, each starts a small impulse of energy. Maces: "Power Sphere". Elemental charge, with low speed. Explodes on hit. War Axes: "Vertical Cleave". Vertical wave of energy. It passes through enemies. Small angle of impact. Daggers: "Escape". Moving a player forward to the middle distance. Explosions occur at the start and end points of the trajectory. Dualwield: "Double Cross". Two strikes by left and right weapon at once. Each strike produces two impulses of energy in the form of crosses. Impulses pass through enemies. Bows: "Charged Shot". Charges an arrow. 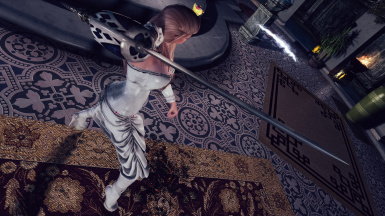 When shooting a bow with a maximum power, a spear of pure energy will be additionally released. Spear pierces all enemies in its path. The duration of this ability is 3 seconds, so it is best to use it when you ready to shoot. Shields: "Onslaught". Two blows with a shield, first one releases a force wave that knocks down all opponents in front of the character, second one produces a loud explosion that damages enemies around and stuns them. Staves: "Sphere of Magic". For a short time, strengthens all elemental spells that correspond to the type of element of the staff. Including spells that are used by other skills, as well as weapon enchantments. If the staff is not "elemental"-type, then a protective sphere arises around the character, which can throw the enemies attacking the player. Bleak Fall Barrow. First room. The book, from which you can learn the ability, lies to the left of the entrance, near to the corpse. Also you can use AddItemMenu mod. If you want to use the skills for the shield, the left staff, as well as for the two weapons - then when using the ability you need to press and hold the "special button". By default, this is the left SHIFT. If the button is not pressed, then the skill for the weapon in the right hand will be used. Damage of the skills depends on the skill-level of corresponding weapon tree. 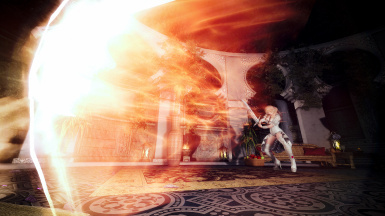 For example, the higher the skill of two-handed weapon, the more damage the abilities with this weapon will inflict. Skills ignore armor and target resistances. Three basic elements of enchantment are supported: fire, frost and lightning. To determine the skill of which particular element will be used, only the first enchantment effect is important. The rest enchantments and effects do not matter. If there is no enchantment on the weapon, or if it does not fit the condition above, the “fourth element” skill will be used - this is usually a “physical” type damage. For shields and dualwield, this "fourth element" will always be used. 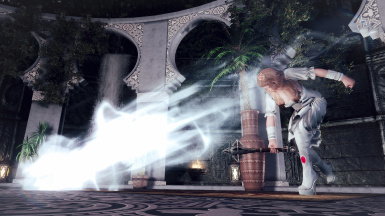 During the use of skills, the character enters the "hyperarmor" state - it cannot be knocked down or paralyzed. 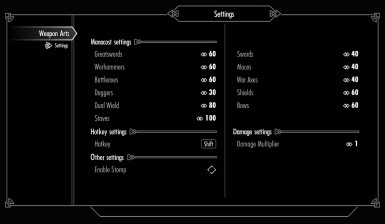 The mod has a MCM where you can set up magic consumption with all skills, a global damage multiplier for them, as well as a “special button”. FNIS is not required. All animations are taken directly from the game. The combat skill will not be used if your character is in any animation state except for moving (made for stability reasons). In other words: if a character attacks, blocks, jumps, "staggers" after a strike, or rides a mount - using the ability will not give anything. Note that using Lesser Power type abilities has a "cooldown" of three seconds. Do not spam the button - it will not work. And yes, if you used the ability in one of the statuses listed above, the ability also goes into "cooldown". Since the mod is almost entirely built on scripts, it is very sensitive to the speed of your game. It is recommended to have a stable 60 frames per second, otherwise there may be a noticeable delay between pressing the button ability and the beginning of combat skill. Yes, the script engine of Skyrim is tied to the frame rate, and I can't do anything with it. Sometimes character's legs may become invisible while animating certain skills. Jump to fix that. I have no idea why this happens. There is a special ability: "Stomp" - character stomps very hard on the ground, causing a small earthquake. Made more for fun than for real use. It is a bit unstable (it does not have animations for a first-person view, and “legs disappear” mostly when using this ability), so it's disabled by default, but you can enable it in MCM. You can use this ability when character does not have any weapons equipped, or when equipped with a two-handed weapon, but while the "special button" is pressed. And sorry about my English - it's not my native language.